November 3, 2013 - On Saturday evening two airplanes caring skydivers collided in midair at or about 12,000 feet over Superior, Wisconsin, close to the Minnesota state line. 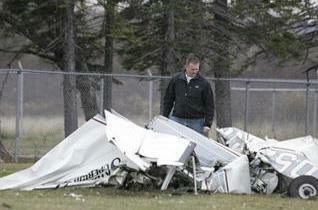 None of the nine skydivers and two pilots received any serious injuries. The two Cessna aircraft of Skydive Superior had departed Bong Airport in Superior, Wisconsin in formation for what is known as the "sunset load" the last jump of the day. Both aircraft had reached their climb altitudes. Four skydivers and a pilot were in the lead plane and five skydivers and a pilot in the trail plane began to prepare for what was to be a routine jump. The skydivers of the lead aircraft exited the aircraft onto the step of the aircraft while maintaining their positions on the step in a jump formation the skydivers in second aircraft began exiting their aircraft and positioning themselves onto the step of their aircraft. Three of the skydivers in the rear aircraft had positioned themselves out on the step of their aircraft the other two skydivers were preparing to exit the aircraft and take their positions on the step when all of a sudden the tail aircraft came over the top of the lead plane and descended on top of the aircraft resulting in a wing separation of the lead aircraft and turning it into a ball of fire. The skydivers each had several hundred hours of jump time and were either instructors or coaches. Each skydiver was able to jump to safety as well the pilot in the lead plane who also had a parachute. Skydive Superior instructor Mike Robinson said the “skydivers had parachutes that allowed them to steer themselves away from the falling debris and toward the planned landing spot. They opened their parachutes between 3,000 and 5,000 feet and landed safely”. Roberson further stated the pilot in the lead aircraft had an emergency parachute that was non-steerable, the pilot landed and suffered minor injuries. 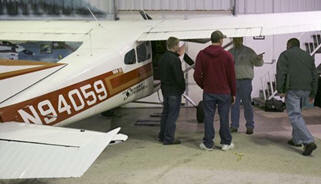 The pilot, Blake Wedan piloting the tail aircraft (N94059) was able to land safely.